Corner forwards Rory Kavanagh and Michael Doherty helped steer Donegal to a 1-13 to 0-11 triumph over Derry and into the Ulster SFC final at Clones. In front of a 17,331-strong crowd, the duo put in an excellent display of shooting to rack up 1-09 between them. Conal Dunne flicked on for Doherty (1-04) to crash home an eighth-minute goal. Donegal led by 1-05 to 0-04 at the interval with Derry's Enda Muldoon kicking three frees. Three times Derry managed to reduce the gap to three points in the second half but their day ended on a sour note when Muldoon was red carded for punching. In the first half, Donegal suffocated a Derry attack that had begun so well in their defeat of All-Ireland champions Tyrone. Paddy Bradley was kept scoreless as the Tir Chonaill defence, with the likes of Paddy Campbell, Eamonn McGee and Barry Dunnion in excellent form, threw themselves about. Kavanagh and Muldoon swapped early points before the latter was dispossessed deep in the Donegal half in the lead-up to Doherty's goal. Six assured passes followed - the last from full-forward Dunne - before Doherty cracked a brilliant shot beyond the grasp of Barry Gillis and in off the post. Donegal's short passing game was causing havoc for Derry and points followed from Ciaran Bonner (0-02), Doherty and Kavanagh. In between, Muldoon added two more frees with corner back Francis McEldowney showing the Derry forwards how it is done by pointing in first half injury-time. Donegal looked set to raise a second green flag in the early moments of the second half but Kavanagh was foiled by the outstretched leg of corner back Kevin McGuckian. It took eight minutes of the second half before Doherty angled over a free. Kavanagh helped Brian McIver's side move 1-07 to 0-04 ahead in the 44th-minute. Three successive Derry points from Bradley, Muldoon and Joe Diver made it a three-point game, but every time the Oak Leafers threatened a comeback, Donegal had enough to stem the tide. Kavanagh's fourth point from play and a lovely effort on the run from corner back Karl Lacey pushed Donegal 1-09 to 0-07 clear. A fisted score from Diver and another Bradley point cut the deficit again to a goal. Doherty popped up with his third free on the hour mark and five minutes later, a clearly frustrated Muldoon received his marching orders for getting involved in a silly altercation. Doherty's day ended on a horrid note when both he and Derry substitute Paul Cartin were forced off the field following a bad collision in injury-time, just after the Donegal corner forward had scored his fifth point. 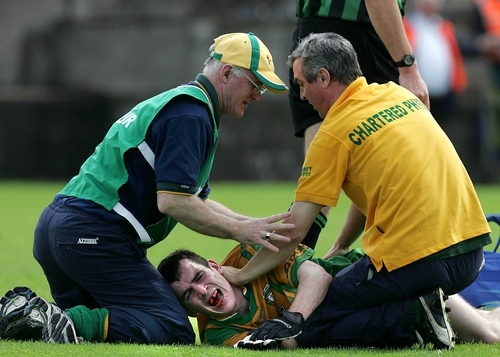 There were fears that Doherty had suffered a broken leg, broken jaw and lost two teeth in the clash with Cartin. Two more points from Bradley mattered little in the end as Lacey, Doherty and Kavanagh fired over again to keep Donegal on track for their first Ulster title since 1992. They await the winners of next weekend's semi-final replay between Armagh and Fermanagh. Donegal: P Durcan; N McGee, P Campbell, K Lacey (0-02); E. McGee, B Monaghan, B Dunnion; N Gallagher, B Boyle; C Toye, M Hegarty, C Bonner (0-02); R Kavanagh (0-05), C Dunne, M Doherty (1-04). Subs used: D Diver, A Sweeney, C Kelly. Derry: B Gillis; K McGuckin, K McCloy, F McEldowney (0-01); L Hinphey, P McFlynn, J O'Kane; J McBride, J Diver (0-02); M Lynch, B McGoldrick, F Doherty; E Muldoon (0-04), P Bradley (0-04), E Bradley. Subs used: G Donaghy, P Cartin, T Kelly, B Mullen.